These photographs first appeared August 11, 2000. This week: a string of boats in the WHITE WATER lineage from Don McIntyre, in reverse chronology; and a new Whaler that gets plenty of use by the whole family. Another great photograph from Don McIntyre shows a previous WHITE WATER in the North Channel at Bears Back Harbour c.1989. This is quite a unique boat. That nice long waterline hull is the classic Boston Whaler 25-foot model, but in the Revenge Cuddy version the controls have been moved to a starboard forward location, and a windshield has been added to the cuddy. This creates a huge open cockpit. And instead of outboard power, there is a 260 HP I/O. What doesn't show is the superb varnish work on all the wood. We'll continue the debate on whether this is a Revenge or an Outrage in the FORUM. 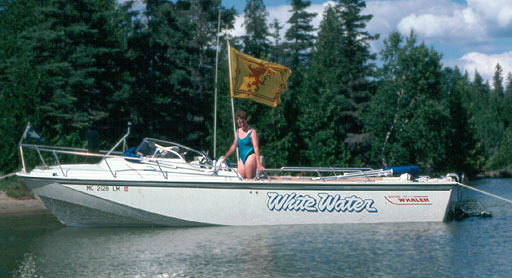 By 1986 when this shot was taken in Lake Huron, Don has added a nice teak swim platform to the transom. "The little blond," says Don, "is now a 5'10" 17-year-old." 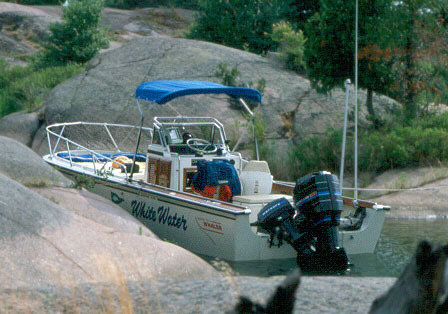 Another in Don's series of WHITE WATER boats was this Outrage 22, powered by 200 HP of Mercury outboard and covered with Mills & Co. Canvas, here with the Flying Top set. Readers of the Boston Whaler company's newsletter might recognize this shot; it ran in one of their quarterly issues some years back. As for the rocky pool of water she is floating in, Don says, "How I got her in there, I haven't a clue!". Again, the location is Lake Huron's North Channel, this time in Fox Island's south harbour in the summer of 1980. Take a good look at those rocks. That is just what the lake bottom looks like up there. There isn't much mud or sand, just rock. Another North Channel location, The Pool, attracts boats of all sizes, and in 1978 Don took his new Montauk up there. There's more Mercury power on the transom, this time a 90-horse. 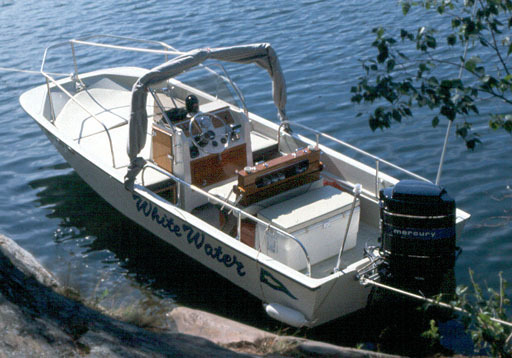 Note the custom forward platform and cushions in the bow, as well as some custom canvas that can cover it, attaching at the gunwales with Mills clips. Classic Boston Whaler boats aren't the only ones getting use. Here is Mark Gallagher's newer Dauntless out on Piney Creek Cove on Elk River in the Chesapeake Bay. 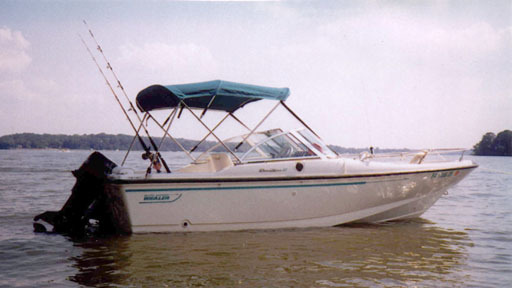 A V-4 Johnson 115 HP supplies the power for Mark, his wife, son (6) and daughter (3) to get out on the water for cruising, fishing, and crabbing. 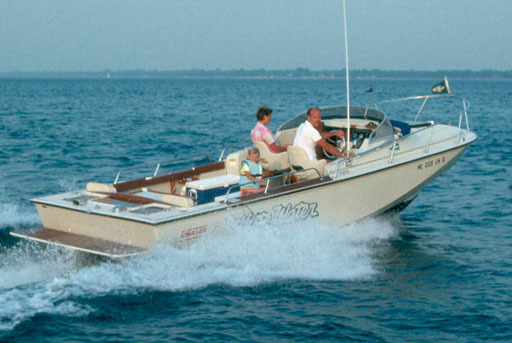 The dual-console style is popular with families, as it offers plenty of seating options from bow to transom. The Dauntless nameplate has moved to the current low-freeboard center consoles, and the dual-console layout is now the Ventura model.